You are here: Home » Are you there blog? It’s me, Laura. I have Raspberry Scones. You know how some food bloggers parlay their work into cookbooks? Or become food writers or food photographers. Or pursue a full-time career in the culinary arts. Not me. This little blog, which I have woefully neglected lately, has not gotten me a food-related job. But it has helped me get a web-related job. Three weeks ago, I joined SUNY Geneseo at its Web Communications Manager. (Check us out on the TODAY show!) I’m work in the College Communications department, and I’m in charge of the College’s strategic communication and brand conformity across the web, which includes our website (re-launch to come soon) and social media. But back to the topic at hand: all that time spent writing about and photographing food, updating on facebook, tweeting on twitter, etc. etc. — it all helped me land my new job. I don’t think I would have gotten an offer without my time spent here. It’s so strange, isn’t it? When you do something as a hobby, you just see it as that: something pleasant to do to pass the time. But you never know when your playing will turn into something bigger, and when it does, it’s a happy surprise. Our department is housed in a renovated frat house (insert joke here), which means we have a full, working kitchen. (Also, one and a half baths.) 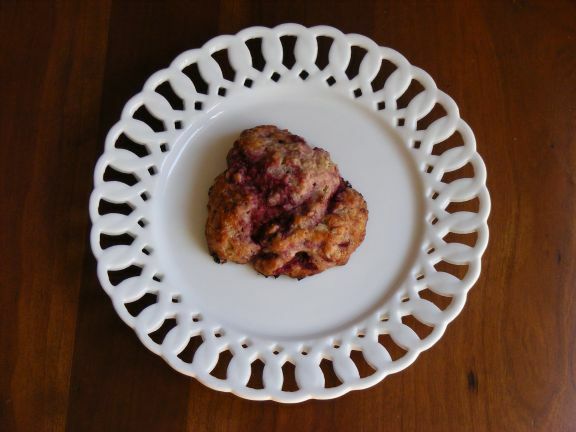 So about a week after I started, I brought in some raspberry scones and heated up in the oven before serving. They disappeared quickly. I don’t think there’s anything wrong with using baked goods to assist with job-security, do you? In a small mixing bowl, whisk together the milk, egg, and vanilla; set aside. In a large bowl, mix together the flour, baking powder and salt. Add in the cubed butter and use a pastry blender or your hands to work the butter into the dry ingredients; the butter should resemble small peas. Add in sugar and raspberries and mix gently. Using a rubber spatula or a wooden spoon, pour in the milk/egg mixture, reserving about a tablespoon for later. When the dough forms into a ball, knead the mixture a few times with the spatula/spoon and drop large spoonfuls of dough onto the prepared baking sheet. Brush remaining milk/egg over top each scone and sprinkle with remaining tablespoon of sugar. Bake for scones for about 15 minutes or until golden. Cool on a rack. Yields 8 – 12 scones. I cannot believe you never received a food related job offer. I am a caterer and I know that your web site is the best. Any recipe I have tried is just fab. Glad you are so pleased with your new position, but please, please don’t give up your site.